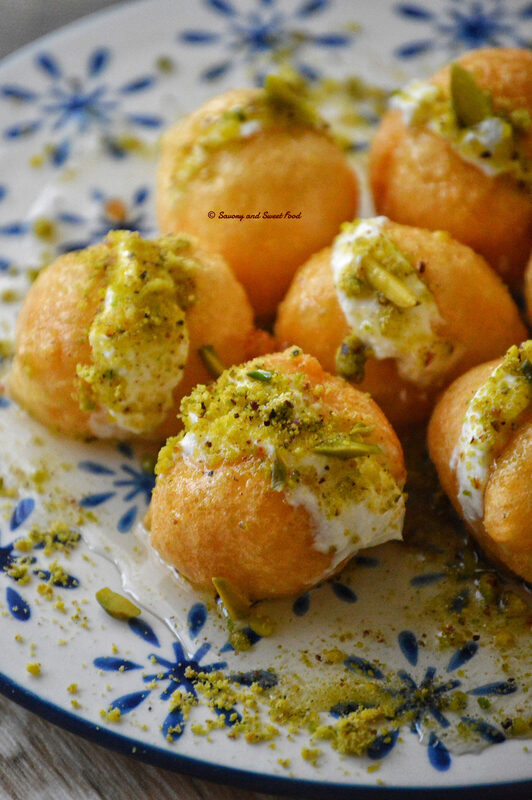 Luqaimat with Cream is a puffy sweet fried dumpling, dipped in sugar syrup and served with thick cream and pistachios. Its the 4th day of Ramadan today. Days are passing by too fast, and before you know it, Ramadan will get over soon. Really hoping that the time goes slow. Already 4 days of immense mercy are over, another 6 days left. For those who didn’t know, Ramadan is known to be broken down into three parts. The first ten days of Ramadan are known as the “Ten days of Mercy”. The second ten days are a time for seeking forgiveness from Allah. And the third ten days is for seeking refuge in Almighty from Hellfire. So this is time to ask for mercy to Ar-Rahman, The Most Merciful. Hope we all can utilise this precious time to the fullest. So lets go to today’s dish, its an Arabian sweet dish which is popularly made during Ramadan, its Luqaimat with Ashta (cream). 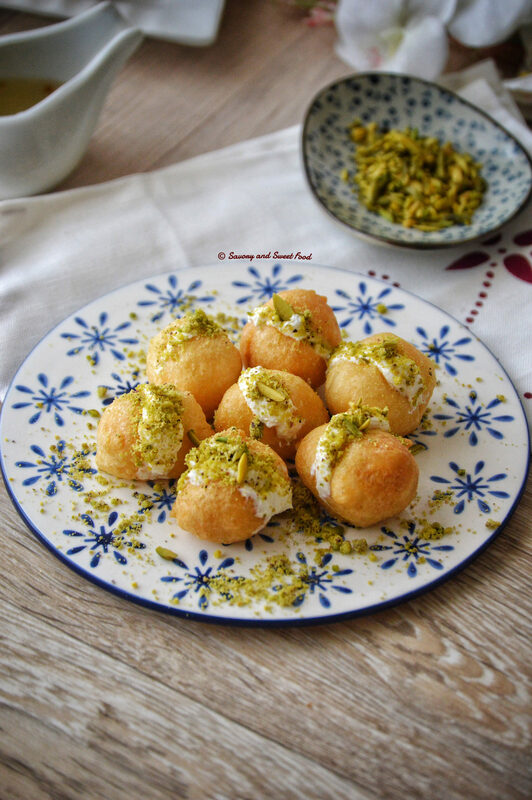 This sweet item is a must in the Arabian household during Ramadan. 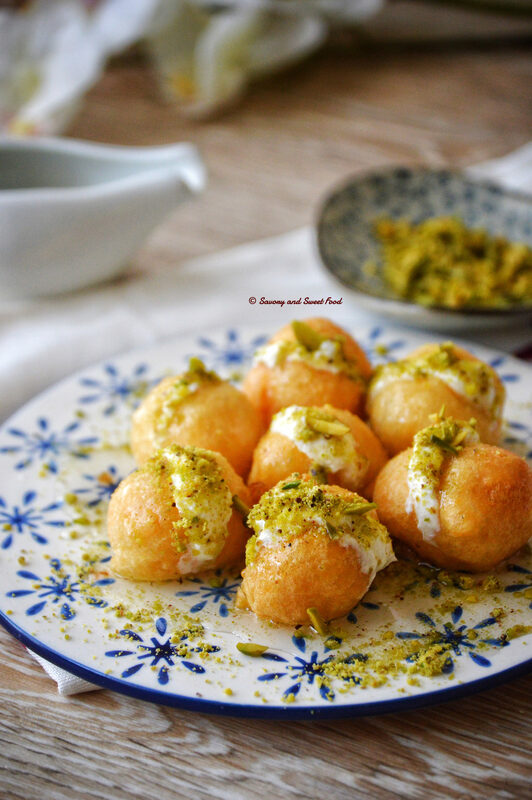 For me and my family Ramadan food is all about Arabic sweets even though we are Indians. But yeah, the savory snacks are mainly Indian. Luqaimat is all of our favourite. I wanted to do something different with the traditional luqaimat, so I slit open the fried dumplings, added some thick cream and then poured the sugar syrup over it. It was really really yummy. So here I am sharing this recipe with you all. Hope you enjoy it. It is a little difficult to get the perfect round shaped luqaimat. I didn’t master that skill yet. But whatever the shape, it tastes superb. 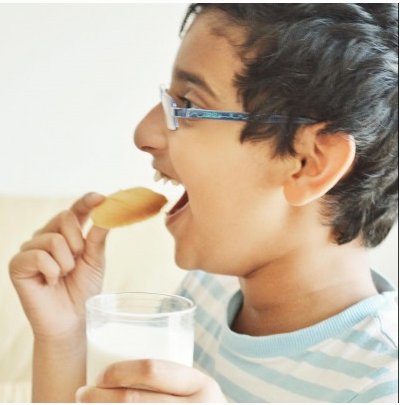 The sugar syrup should be at room temperature while adding the fried luqaimat into it. The consistency of the batter is very important. Make sure that it is not very loose or very thick. Instead of sugar syrup you can use date syrup too, but when using dates syrup have it without the cream. In a bowl add all the ingredients except the water. Pour the water gradually till and whisk till you get a good consistency. It shouldn’t be very thick or too loose. the batter should be free of lumps too. Once you mix everything, cover the bowl with a plastic wrap and let it rise for an hour or two. a) If you are n expert, then just drop in a little of the dough in small rounds into the hot oil and fry till golden brown in color. b) Dip the teaspoon in a separate oil, then take a heaped spoon from the batter, then push the batter off it using another spoon. Be careful while dropping the batter into oil. c) Take a handful of dough with wet hands. Dip a teaspoon in another oil. Squeeze out the dough between your fingers like how it is shown in the video demo. Scoop out with the oiled spoon and fry it. d) Add the dough batter into a piping bag. Snip off the end. With oiled hands pinch out the dough from piping bag into the oil. 5. Drop the fried luqaimats into the prepared cooled sugar syrup to coat it well with the syrup. Take it out and keep in a plate. Slit open the luqaimat on one side. Add in the cream into this. Sprinkle some ground pistachios. While serving pour the sugar syrup over the cream. 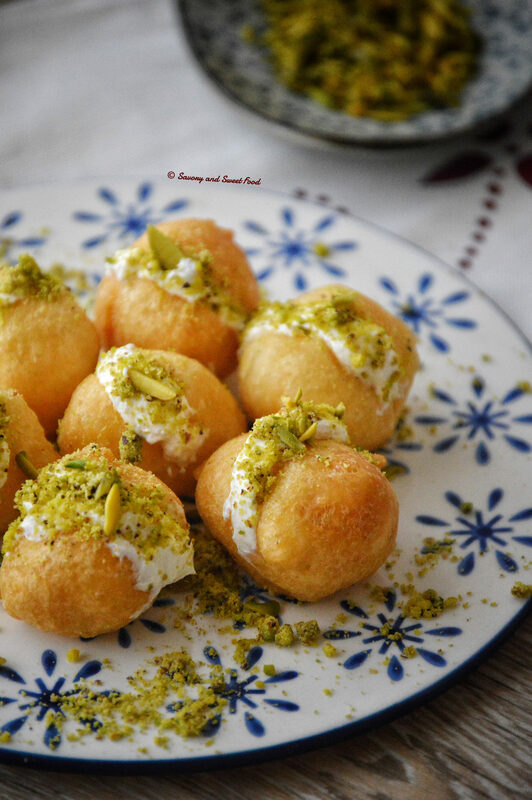 Luqaimat with Cream is a puffy sweet fried dumpling, dipped in sugar syrup and served with a thick cream and pistachios. 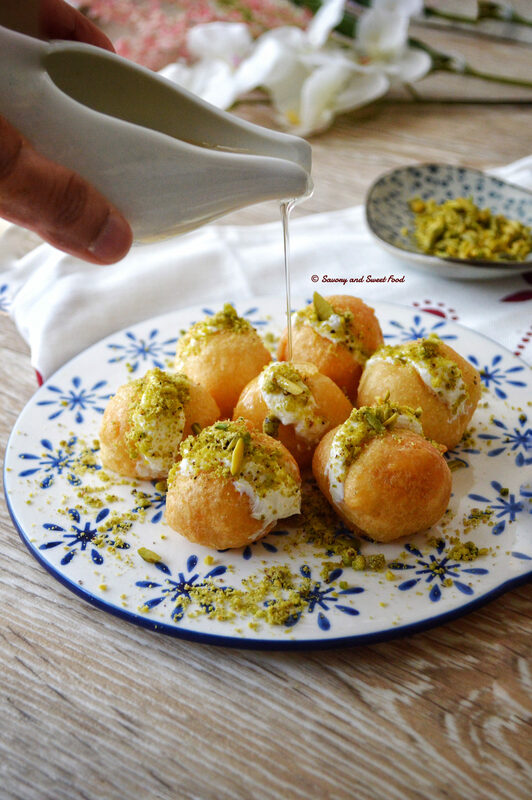 Drop the fried luqaimats into the prepared cooled sugar syrup to coat it well with the syrup. Take it out and keep in a plate. Thank you! Please try this Shazia! Hope you will like it. Yeah, for some reason I need to do some change or add a twist to most recipes. Only then I get a satisfaction. Had many Luqaimat earlier, with cream this was my first time. Superb taste. Now onwards will try this only with cream..Ur recipe made it so crispy outside and tender inside.